Mikhaila Fornah is a pre-med student at Penn State working to graduate and gain admission to medical school. For the past four years around this time, she finds herself on the fourth floor of the Pattee Library tucked away from madness of THON. Though she finds THON important, she believes that her efforts are better suited to studying and earning her medical license to help children in need rather than raising money for research. With every turn of a page she finds herself closer to her dream. 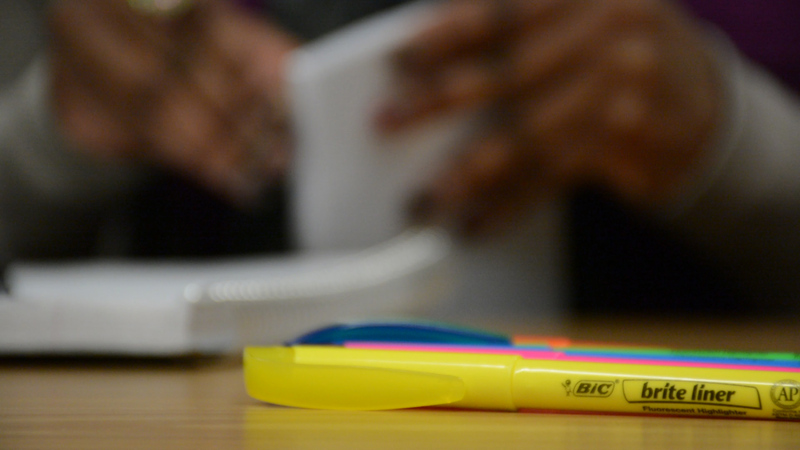 With an array of highlighters, a trusted black in pen and a fortress of medical books Mihkaila pushes onward through the night to hone her skills. Jason Marko studies chemistry and is a member of Thespians and a THON volunteer. He is a security leader on a Rules and Regulations committee. 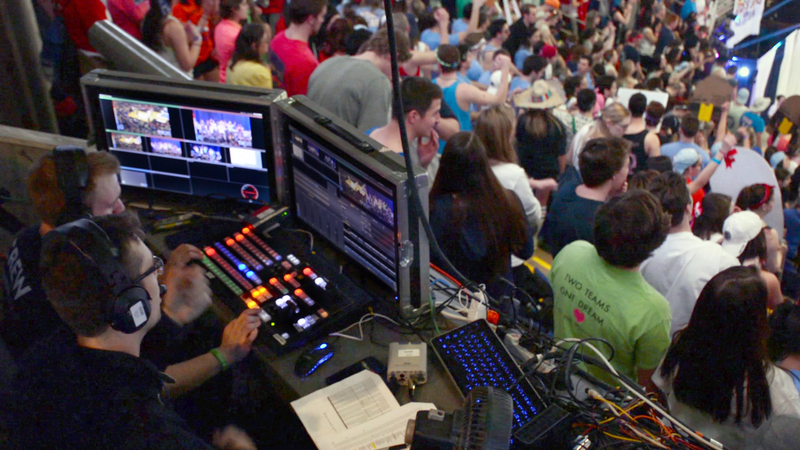 During THON weekend he helps committee members deal with any spectator problems and ensures the safety of THON volunteers. Thomas Gill is a senior at Penn State majoring in psychology. Gill was part of the OPP committee. OPP is involved with the set up and tear down of THON as well as keeping the Bryce Jordan clean during the weekend. Thomas enjoys being a part of THON because he does it for his five nieces and nephews who he says he couldn’t imagine his life without. Antonella Crescimbeni is a photographer for Penn State's independently run student newspaper, the Daily Collegian. 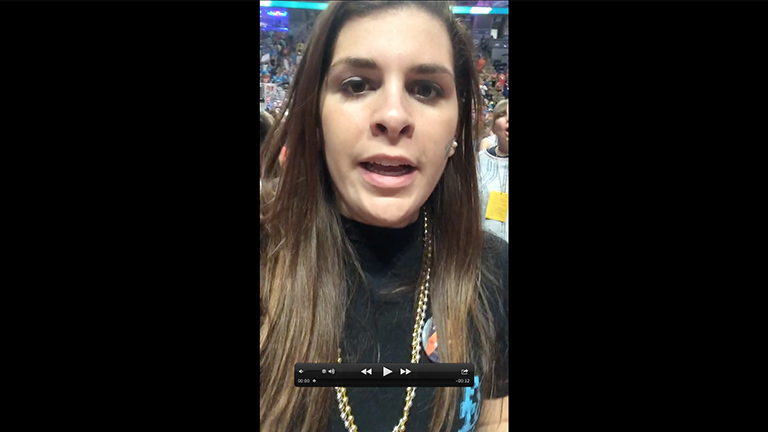 For her shifts on the THON floor, Antonella got up front row seats to all the on-stage action. Alex Delucia is the captain of the Rules and Regulations committee nicknamed guaR&Rdians of the gALEXy. Alex is a junior at Penn State and is a first time captain for R&R. Alex is one of 24 captains and has her own committee of 37 volunteers. As a captain Alex is the committee relations liason, which organizes events within her captain committee. They organized their hundred days booth, captain mail and captain gear. Jake Somerville is a Communications Chair for THON. On Sunday he was one of the three people manning the information booth in Portal 1 by Gate A at the Bryce Jordan Center. 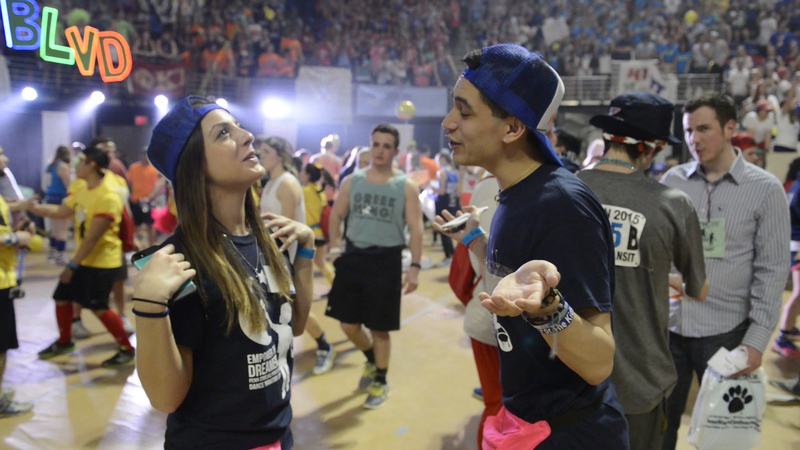 Giuseppe Parente geared his entire senior year towards being chosen to represent the Penn State Thespians as one of their dancers in THON 2015. That dream was cut short when seniors Hailey Rohn and Jess Goble were chosen over him, but he finds comfort in the fact that two of his closest friends are representing their organization. Taylor Milano is dancing for Foto and filing video reports about her experience from the floor of the Bryce Jordan Center. As the band Go-Go Gadget takes the stage, she realizes she only has an hour to go. Junior Kaycee Corcoran is in the midst of her second semester at University Park. This weekend she had the chance to experience THON personally for the first time. 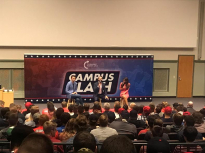 Through her extracurricular club, the Student Philanthropy Council, she was able to access a pass that would allow her to enter the floor level of the event. However, after arriving at THON, she realized the experience was a bit too overwhelming for her and decided, after a short stay, to watch the rest of the event from home. 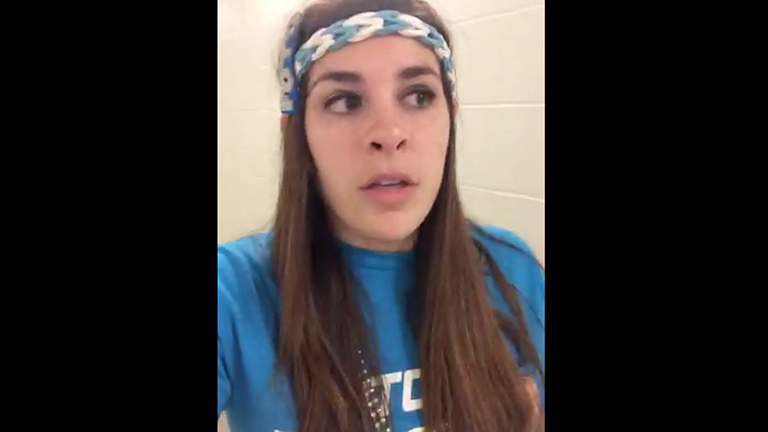 Amanda Hendrix is a dancer for THON 2015. She has been involved with THON since her freshman year at Penn State after hearing about it through her softball team. She has known people who have died from cancer and says it was a no brainer for her to get involved with the organization when she got to Penn State. Anna Dubiansky speaks about her years on the OPPerations committee, including all of the behind-the-scenes work, the dirt, and the early arrival (and late dismissal) of the OPPerations committee. 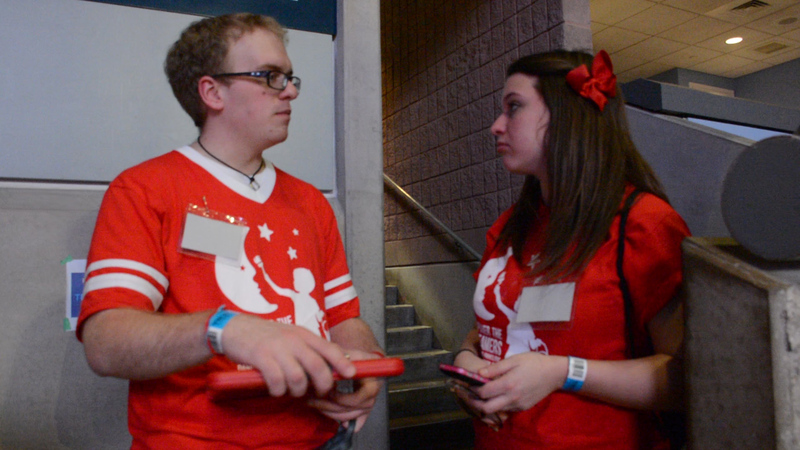 Daniel Bolton, a former employee at WPSU, has been a part of THON for years. Last year, shooting for a webcast, he came up with the idea to incorporate an experience that is more interactive than in previous years. Since August, Bolton has been preparing for this huge event – finding talent that will help him create the best product possible. Mara Scaliti, a senior Labor, Employment and Relations major at Penn State is apart of THON 2015 as a member of an OPP committee. OPP committee members are in charge of the set up, tear down and cleaning of the Bryce Jordan Center and now Pegula Ice Arena during THON weekend. As a committee they have one of the most labor intensive jobs THON weekend. Carl the Conqueror is a character created by a student wearing a mascot costume that was donated to THON. Carl represents the heroic qualities of children battling cancer. Scott Warner, a THON 2015 Hospitality Captain, had the opportunity this weekend to be inside the Carl costume. 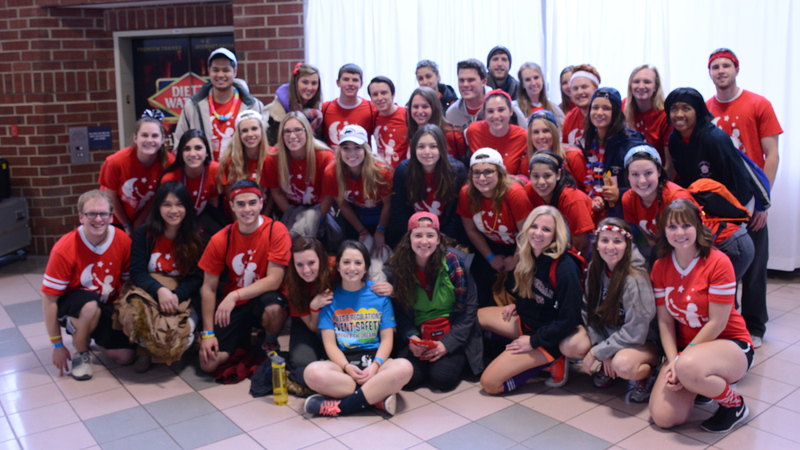 Penn State senior, Janelle Rushton, is on the Special Events committee for THON 2015. This year, the committee started a new project called 'Dancer Notes'. It's another way for families and friends to write messages to the dancers to keep them motivated for the 46 hours. Caity Kramer is a junior at Penn State and a member of the THON Photography Committee. As a photography committee member, Kramer is allowed access to all moments of THON and captures them to share with the rest of the community. Penn State senior majoring in Marketing and Visual Communications with a minor in Entrepreneurship and Innovation. I’ve lived in the Philadelphia area my whole life, and I’ve been a fan of Philadelphia sports and cheesesteaks since the start. THON has also been very important to me during my time here, and I’m excited about all of the awareness and possibilities that multimedia has brought and will continue to bring in the future. My name is James Hirsch. I am studying Broadcast Journalism at Penn State. My career goals are to work with a professional company that deals with different forms of media. My name is Pharaoh Williams and I am from Philadelphia, Pennsylvania. I am a junior, and majoring in Broadcast Journalism. I hope one day to be anchoring The Today Show, or even producing my own talk show. In high school I participated in many things. One of my important accomplishments is hosting several TV shows for the School District of Philadelphia’s Network. I have been acting for a while, and have been in over 20 plays. . In my spare time I enjoy listening to music, and watching TV. Paul Jones is pursing a broadcast journalism degree with an interest in sports production. 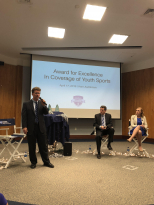 He worked for Penn State Intercollegiate Athletics as a camera operator, has interned at ESPN 1450 and is the co-host of Real Talk on ComRadio. In the future, he hopes to be involved in sports whether it’s production or as an on-air talent. Maddie Klebe is a senior from Wayne, Pennsylvania, and majors in Visual Communications at Penn State University. After graduation, Maddie aspires to become a photojournalist and eventually own her own photography company. I am a senior at the Penn State University majoring in Broadcast Journalism and minoring in Business. In the future I hope to be a producer for a major news organization. Currently attending Penn State University pursuing a degree in Photojournalism. Currently I am a Senior Photographer at the Penn State student newspaper called The Daily Collegian. On my own time, I love photographing anything automotive. I’ve made pictures at motorsports events, car shows and everything in between. I hope to become a producer for a sports or entertainment newscast. My dream is to move to Los Angeles or New York City to pursue this career.